I’ve been dying to hear how you got on! Your stall looked fantastic and your assistant certainly scrubs up well! I agree with everything you’ve written. Oh yes, that’s what amazed me when i did my first fair, how lovely the other traders are. Everyone wants to help, they’ll offer to look after your pitch if you need a break, discreetly advise you if they think you’ve under-priced anything and generally be kind and encouraging. No rivalry. We’re all in it together. Those card readers are brilliant, ours is a swipe one, too. It really does encourage people to buy, it’s a whole lot less painful than real money! The constant bargaining drives us daft. Someone tried to haggle over a £3 tie on Sunday! So many people don’t “get” vintage. Although the bigger fairs we do vet the sellers and their stock, we used to do smaller events where traders sold nasty Chinese-made repro and bog-standard second hand stuff. It used to really annoy us that we’d got a stall of carefully sourced, laundered and beautifully presented vintage clothes and we were ignored by people rummaging through modern day tat. Isn’t it horrible when someone really loves everything you’re selling and nothing will fit them? 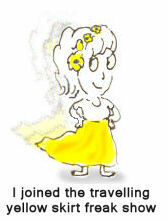 That’s why I bring along a selection of hats, handbags, gloves and shoes so there’s something for everyone. 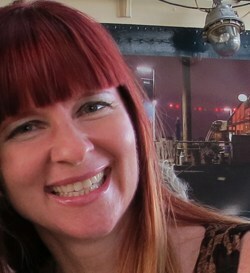 I got some great press after the event which was wonderful exposure so I am considering doing the spring show. They only have two per year, so I can plan it out well in advance to have some help. I agree, seeing people in love with pieces that don’t fit is heartbreaking for both of us. I guess I need to get some hats in my stock! I need to get busy…my store is woefully empty compared to my house! I think Instagram will be the first place I list and then Etsy second. IG is just so much easier. OH YIPPEEEE! I was hoping to see photos of your booth! Thanks for sharing! I wondered how your weekend went – sounds like it was mostly a positive experience aside from the occasional snarky customer. Your booth looked very well organized, with lots of space available to be able to actually look at the merchandise. It drives me crazy at shows where the booths are so crammed with stuff you can’t turn around without knocking something, or someone, over. I really enjoy going to Vintage clothing shows, but having been ill so much this year has meant I’ve missed out on getting to any. I’m so sorry to hear you have been feeling ill for so long. Hopefully you’ve moved past the worst of it now. I was very cognizant of ensuring the booth was open enough not to have those issues as that also drives me nuts as a buyer. I detest racks that are so stuffed you can’t move anything to see what is hanging on them. I admire you and Vix doing the vintage clothing faire routines. I do know how much time is takes to prep those clothes. I did an online Etsy shop last fall but overpriced everything so I only sold 1 item. I think there is a real skill to knowing how to price an item. I’m still trying to grasp it myself. Normally I go by what I paid for the item and then consider how much I’d be willing to spend on it. I still feel like this is a big learning curve for me though. I’ve been waiting for this post! So glad it was considered a success. Robert truly does fit right in, bless his heart. Your points are right on!!! I’ve been to one show here and find most customers are there with a vision in mind and also out for a pleasant experience. I’ve also found the vendors to be just as you described. Now I’m going to head over and read to write up on you? You would have LOVED it Trina! One of these days we will get to one together! your booth looks really appealing, tidy and colorful!, and I would love to see what you’ve worn!, anyway, your husband looks fabulous wearing his hat, perfect for the occasion! I will be recreating the outfits with better lighting and less stress on my face for your viewing pleasure, ha ha! I’ve learned in life that it is not activities that matter but the quality of the people who do them. In this case, YOU are involved which means that your effort at this was smart, industrious, sensible and attractive. I can’t believe how big your booth is and how enticing your wares are. You did it right, my friend. As you do everything right. Thanks for sharing your experience with us. I wanted to keep the booth space clear so that it wasn’t crowded inside and people could still move. I’m still not sure if it was the best move or not. The booth and the Etsy store look sharp! Nice going and way to learn/grow! I can see how this could be a fun time. Although, I’m not a seller either. I like what I like, and I realize there are pros & cons to everything. But i abhor trying to talk someone into something. As for the rude people….gosh, don’t you see that everywhere? It always saddens me. Why do people have to be like that? Or are they that clueless? Our fave saying is “people are people”. In fact, when my husband and i took our year sabbatical after selling my practice, we said we need some time to learn to like people again—crazy, huh? I’m very proud of you that you didn’t buy anything—I think that would take incredible restraint. So where did you get all of the things you sold? I’ve been “collecting” items via thrift, estate sales and online bids. Probably 85% of my finds are through thrifting. I have found now though that the thrift stores here have all raised their prices and it isn’t as viable as before. Now, if I want the reseller’s price I need to go on the days they have a 50% off sale, otherwise the items are too high for decent resale. wow, what a beautiful stall you had there! 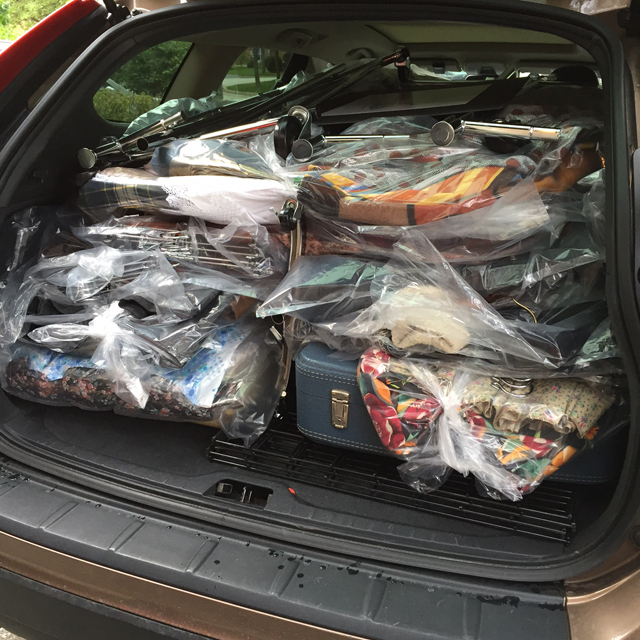 And the clothes… wow! No, I’ve only been to flea markets and to a vintage clothes auction – CHANEL here in Vienna a couple of months ago – but not to an entire fair. Would love to go some day. Wow! A vintage Chanel auction!!! That must have been INSANE!!! Did you buy anything? How exciting! We are having a wonderfully warm summer-like fall in Ontario this year. I’ll send some of it over your way. Duuuuuuuuuuuuude. Your booth looks amaziiiiiiiiiiiing! Like a little boutique. Wow. Wonderful job! Sorry about the rude customers. Sounds like you know how to handle them skillfully. Still surprised that people will be snarky like that, though. Sheesh. Congratulations, Suzanne! I am so glad to hear it was (mostly, except for some rude people) a positive experience, that you learned some new things and was successful! Many more successful sales to you! Vintage is wonderful, and I’d love to be able to fit in your beautiful clothes – but alas, for me, it does not work so much. I probably visited one or two shows, and I visit some vintage booths in our antique malls – most of what I see are small sizes, sometimes I am lucky to find something that cab work on me, but then I want to also love it, so all in all it’s rather frustrating for me. I also had my own small business and did tons of shows on regular basis, for a few years. I was successful, but at the end, I got so tired of sales. I am definitely not a salesperson at all, though I loved meeting lots of interesting people along the way and made some sincere friendships. 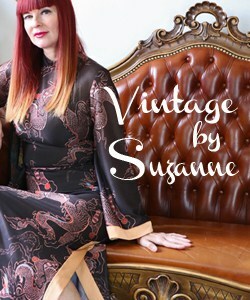 Did you also sell vintage clothing? I bought a lot of vintage pieces from an online estate sale that would probably fit you. One is a gorgeous faux fur 1920’s style opera coat in black, another is a 1950’s free form dress that is your colours. If you follow me on Instagram I will post them there first prior to listing them in my Etsy store. I sold birch bark artwork – there is a link to a gallery on my page, if you are interested. I don’t have Instagram, just Facebook, but I’d be interested to take a look on your finds. Sounds like an overall great experience for you! I am curious, are most of the items you pick out from Estate sales? 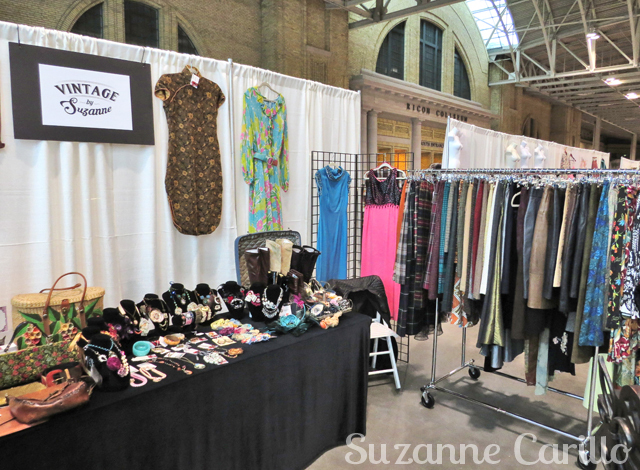 And I am impressed that you didn’t buy anything at the show – great restraint! I have bought many items via thrifting although as I explained in another comment I’m finding it harder as they have recently raised their prices at most of the thrift stores and now it isn’t viable as a reseller. I need to be there on sale days of 50%. I have bought some of the items via estate sales but as of late there haven’t been too many with clothing for sale. I do prefer estate sales as they often have much better prices and unique items. I saw on FB that you were putting some of your pieces for sale. Will have to pop by your Etsy store when you are listing. 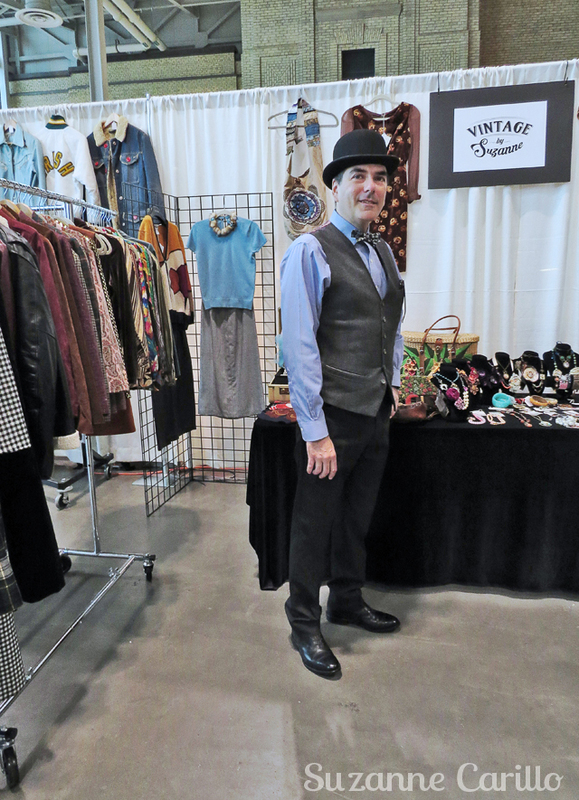 I enjoyed this post as I have not been to a vintage show but would love to attend. I have a hard time standing long periods so it would be tricky, but still so intereting to see what everyone has. I am like you too, I am NOT a salesperson. I have a hard time pushing something on someone I think being natural and showing the fashion is the better way to go. Loved the jewelry you displayed and I am with you on rude customers, I am sure you had to bite your lip a few times! Well done Suzanne, not just for surviving the show, but for giving us the rundown like this too. I’ve done big art fairs and even then all the vendors really push the boat out with getting dressed up for the event. I wish we’d seen what you wore, but hey, that’ll have to wait until your next one eh? Well done, too, to your other half for helping out – it’s so good to have someone to bark at when stress rises who doesn’t burst into tears or flounce off. Your booth looked beautifully set up and it sounds like you did actually enjoy the occasion which is a bonus. Congrats on not buying anything at the fair – how very restrained of you. I’m not sure if I could have been so well controlled! Good luck with sales of your stock in your shop. These things do take time don’t they? Oh, Suzanne! Your booth looks great. As others have said, it’s no fun trying to shop a show and you can’t get at anything because it’s all smooshed in. If I have difficulty going through the racks, I’ll usually give up and walk away. A long time ago I did a few vintage shows in Florida and I clearly remember just how much hard work it was to pull it all together. Plus, I couldn’t resist buying from other dealer’s booths, which definitely added to my overhead for the day! And I don’t get the rude people either. I would never expect a discount from a vendor unless I’m buying a huge quantity as a dealer, and paying cash! I don’t know where the idea came from that you’re supposed to automatically offer money off. That doesn’t happen in regular retail. You can’t walk up to a salesperson in a boutique and ask them if they’ll take less money for some dress you pulled off a rack. I don’t know why vintage goods are supposed to be different. Anyway, glad you had a mostly positive experience. 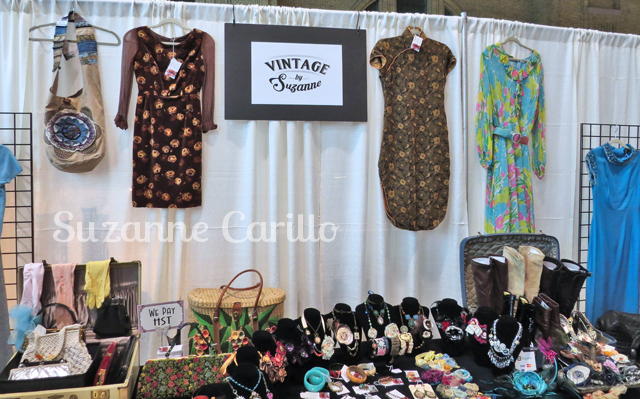 I love to shop vintage shows and have many dealer friends who sell at them. They are all a bunch of fun and interesting ladies. And down here in the states there are definitely different calibers of vintage shows. Some do cater to those who really love vintage and expect to pay a fair sum for quality goods because they appreciate what it is. You will see some of the most beautiful things at these type of shows and some amazingly dressed buyers. You would fit right in! 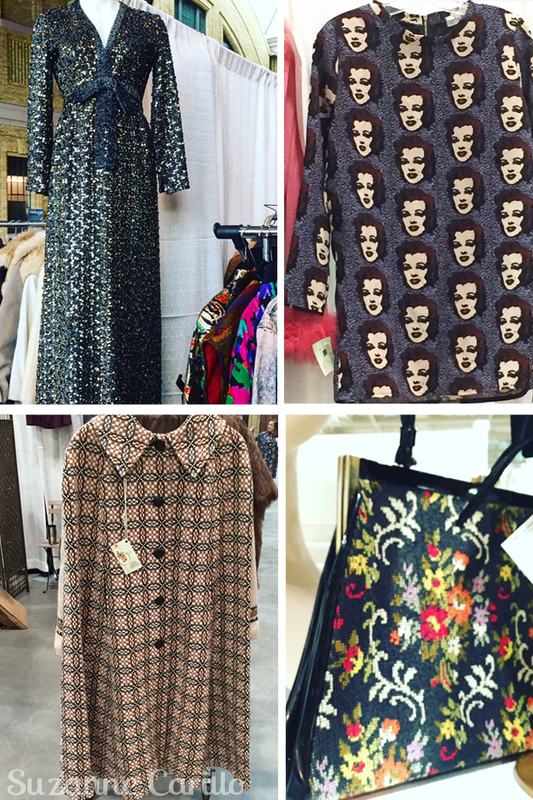 As someone who regularly shops vintage and blogs about it, I love going to vintage shows in Los Angeles and usually come home with something incredible. Though I sometimes shop on ebay, I find the experience of going to the shows and meeting and talking with different vendors about their collection so much more rewarding. Vintage objects tell a story, and the process of finding those treasures is so much more satisfying than buying something new. This looks like a fun process, albeit alot of work, I am glad that fellow vendors were fun to be around, and that most of your buyers were nice. Your husband is in the spirit, too, very nice! 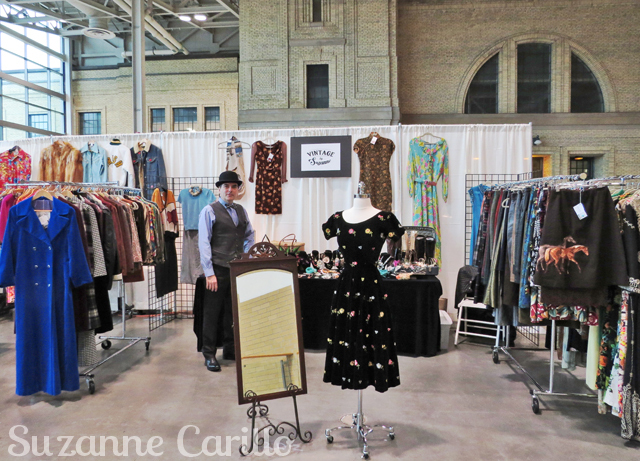 I have never been to a vintage clothing show, simply because there aren’t any here. I have been to “Collectors shows” with vintage items. That is the same atmosphere and the same type of vendors. They have been collecting their goods first and when the items were up to their front door, they needed to load some off. That starting point is the big difference. They love their stuff. And your booth looked splendid! Applause for you. So sweet that Robert came with you. I can imagine that made it so much nicer. Also applause for not buying anything. I know how hard that is. Kudos for a successful show Suzanne! I would have loved to go if I wasn’t in Seattle at the time. 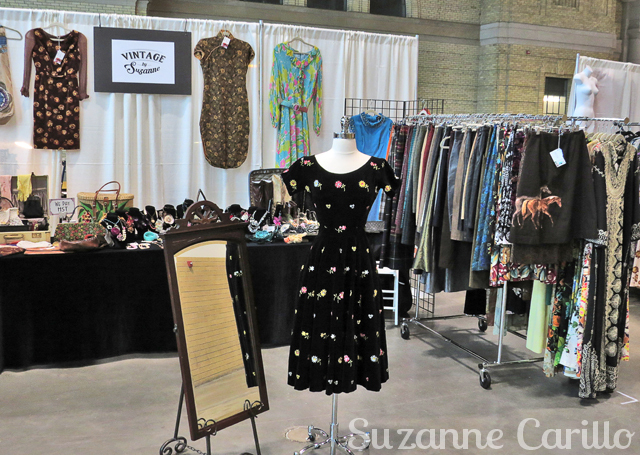 You are so well organized and I know it is a lot of work because I have been a vender at two vintage toy shows: the preparation, packing, set up, pack up everything that didn’t sell and schlepping it home again. What a beautiful stand. Your vintage so nicely displayed that we are not surprised you did well. Very often when we go to vintage fairs the items are really crammed on the rails and displayed so badly it is hard to find anything.